Finnish fone makers Nokia has issued an update to Symbian^3 mobile phones – the latest version of their Nokia OS, with the code name of ‘Anna’. Nokia has released the OS upgrade for the Nokia N8, C7, C6-01 and E7 handsets, where the recently released Nokia E6 and X7 already arrive with the new platform. Symbian Anna has a new user interface, a virtual Qwerty keypad in portrait mode, split-screen messaging, enhanced Nokia Maps, better web browsing and stronger security. The new OS can be downloaded by using the latest 3.1.1 version of Ovi Suite via a PC, or over-the-air directly to a Nokia phone running the older Symbian^3 platform. 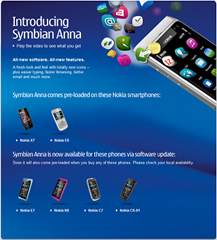 Symbian will still be used by Nokia, where they have stated there will be 10 more phones introduced over the next 12 months running the OS – with further updates to the user experience and support for the software, until at least 2016. Some of the key features of Anna are the new user interface, which brings in a new look and feel with updated icons and multiple usability enhancements. Typing on the touchscreen is much easier to use with the split screen, where message threads, webpages, contacts or emails can be viewed while typing on the virtual QWERTY keypad – also available in portrait mode. 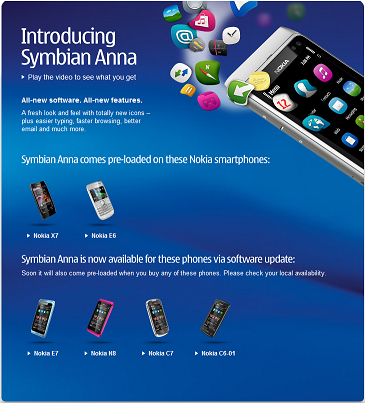 Symbian Anna also has faster and an easier-to-use browser, delivering quicker page loads and improved device navigation that allows people to connect more easily to web sites on the go. Check out the video below from Nokia, that highlights some of the features of Symbian Anna.